The Clayoquot Sound Biosphere is a nature lover's paradise -- a true wilderness playground where the opportunities for adventure are limited by imagination alone. Thousands of pristine acres, hundreds of miles of abandoned roads and old-growth forest trails, volcanic beach scapes, alpine valleys, lush fern gardens, and intertidal waterways attract all manner of untamed marine wild and rainforest animal life. Bear, martens, eagles, whales, seals, sea lions, puffins, porpoises and several endangered species of birds call the sound their home. And here, among majestic landscapes and the wildest of creatures, resort guests work at play. Horseback riding, kayaking, canoeing, whale and bear watching, hiking and fresh and salt water fishing excursions are led by experienced, first-aid-trained wilderness guides. The Outpost's stable of 20 endurance horses and double teams of draft horses promise unbridled fun and adventure. Ride through the many stunning trails in and around the Outpost, through old-growth forest, across streams and rivers, to the edge of Strathcona Provincial Park, watching for bear along the way. Visit the abandoned gold mines of "Bear City", a turn-of-the-century mining town that boomed and busted many times between the great Yukon Rush and WWII. Explore the Bedwell's own "Jurassic Park", a remote area of deep old-growth forest where ancient cedars reach 40-ft in circumference and ferns reach gigantic proportions. 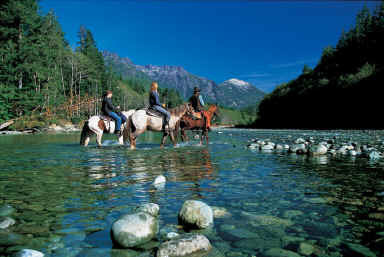 Horseback riding adventures are available for all ages and inclinations. Gallop like the wind through super-oxygenated forest trails, or plod slowly along a stream bed or abandoned logging road. Riding boots and chaps (slickers too, if weather dictates) are provided for all ages. Bike helmets recommended (and provided) for young children. Experienced guides offer expert instruction. The Bedwell River estuary is a marine playground for beginner and expert kayakers. Intertidal play makes for ever-changing landscapes and prolific wildlife viewing. Favourite kayak excursions include whale, porpoise and bear watching in nearby Warren Bay, and the day trek to Flores Island's Wild Side First Nations Interpretive Trail, where hiking and kayaking mix along marked trails of between 5 and 12 kilometres in length. The most popular on-property kayak adventure has to be "the circuit" -- a two-hour loop involving horses, river kayaks, and ear-to-ear grins. Guests ride in a wooden parade wagon drawn by draft horses "Pete and Poke", up alder alley and through lush forest to where the Bedwell and Urses rivers meet. Then, they kayak the gentle emerald shallows back down to the Outpost, starting all over again, if they wish. Experienced guides lead the way. Instruction and safety gear provided. No experience necessary. Paddle Bedwell Sound at 'seal level', watching for foraging bears, otters, spawning salmon, and eagle nests along the way. Ride the tide in and out of the river estuary. 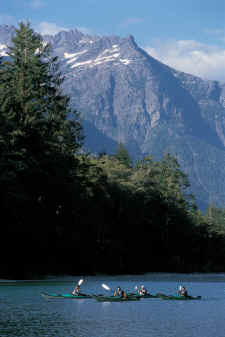 Canoeing around Clayoquot Sound is a time-honoured tradition introduced by the Nuu-Chah-Nulth First Nation. Children especially love looking down into the cool, clear shallows as fresh and salt water meet in the estuary. Explore miles of coastline, replete with marine life like seals, otters, marten, bear, eagles and puffins. Often, whales can be seen feeding in nearby shallow bays. A favourite daytrip is an eight-kilometre paddle from the Outpost to the floating resort at Quait Bay. Stop for lunch at a secluded beach and visit a floating artist studio/organic garden along the way. Virtually every whale watching expedition produces sightings of grey, humpback or killer (orca) whales. And always, guests return grinning from ear-to-ear from the sheer joy of riding aboard the resorts' dual Merc-powered pontoon boat. The combination whale and bear watch includes a visit to Cow Bay, a summer feeding ground of so-called resident grey whales, a trip to 'seal rock' to view hundreds of stellar seals and a neighbouring colony of majestic, and very vocal sea lions. En-route, marine guides will stop at eagle nests and monitor the airwaves and on-board hyrdophone for signs of orca and humpback pods. And always, the resort mandates a strict hands-off approach to wildlife viewing - maintaining a on-threatening distance and ensuring that guests do not feed or otherwise disturb the animals. Bear watching at the Outpost during late summer months especially requires little or no effort. 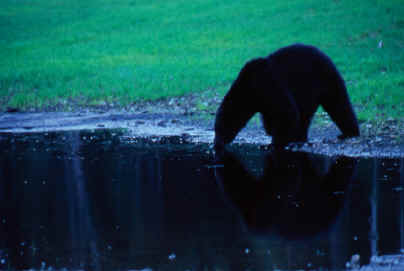 During the spring and early summer, when the bears are feasting on berries, an early morning or dinner time ride or walk around the compound will most-often lead to sightings of black bear in the undergrowth, or at water's edge, upturning rocks along the shore. But in late summer and early autumn, the bears put on a twice-daily show of their own. In the early morning and again around dinner time, a half-dozen or so bear first visit the hay field up-river by the barn - where they snack on tender young hay shoots before making their way down river to the estuary for a main course of spawning salmon. Horseback riding adventures very often turn into bear watching expeditions, and as the resorts' salmon habitat enhancement program grows, so too will the resident population of black bear. See the Conservancy page for details on salmon habitat enhancement and other environmental programs. Left to their own black bear are harmless and completely uninterested in resort goings-on. A strict no-food-in-the-guest-tents policy and a very efficient family of bear-chasing guide dogs keep nosy bears safely out of the camp. Mountain biking Outpost property is both as close to and far away from conventional mountain biking as one can get. The slow-paced level ride down sun-dappled Alder Alley, across wooden bridges and through bucolic meadows is a must-do activity for anyone who has ever ridden a bicycle. The faint click of the spokes, super-oxygenated air, and breath-takingly beautiful scenery, alone, are worth the trip. For the adventurous, bike trails of challenge, complete with requisite roots, boulders and inclines, lie ready in wait. Bikes and helmets for all ages are provided. Hikers of all ages and inclinations find paradise in the miles of trails surrounding the Outpost. Paths of cedar boardwalk, trails through ancient forest cathedrals and lush fern gardens, and abandoned roads deep in the rainforest, showcase old-growth, new growth, and re-forested landscapes and abundant wildlife. A popular day-trek traverses Outpost property, crosses a rope suspension bridge and leads guests into beautiful Strathcona Provincial Park - a mecca for backcountry and alpine hikers. A short hike in takes explorers to the site of "Bear City", an abandoned and over-grown mining town of some repute, that boomed many times between the Great Yukon Rush and 1939, when Chinese workers fled the mines they believed were cursed. A lovely hike for families is through Outpost property and up along the Bedwell River bed - the same path that early explorers took en-route to discovering gold. Still, guests can pan for gold ore in the river's sandy shallows. An unforgettable day-trip to Flores Island and the world-renowned "Wild Side" First Nation Interpretive Trail. Depart in the morning for Cow Bay - home to resident grey whales. This moderate section of the trail allows time for a gourmet seaside picnic lunch. The 12-kilometre hike can be broken-down into sections of varying lengths and degress of difficulty, and includes awesome breakers, volcanic shoreline, old-growth forest trails and cedar boardwalk. Visit Nuu-Chah-Nulth Village - site of the Ahousaht First Nations tribe, then return to the resort in time for late afternoon hors d'oeuvres. Something for all ages and skill levels. This eight-hour marine adventure begins aboard a 25-foot open-air console vessel or our dual merc-powered zodiac and includes whale watching (for humpbacks, grey and killer whales) and a gourmet picnic lunch. 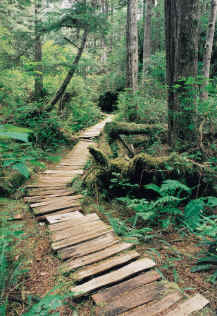 The gentle two-kilometre boardwalk trek to the seven natural geo-thermal pools of Hot Springs Cove traverses stands of ancient cedars, fern gardens and moss-carpeted thickets. The smell of sulphur grows as you near the falls but quickly fades as you venture closer to the first of the pools that descend to a final lukewarm bath near the sea. Clayoquot Sound is home to the largest wild steelhead population in the world, and resort guides know all the hot spots. Fly fish for spring steelhead, fall salmon or cutthroat trout throughout the sound's extensive river system. The Cypre, Megin and Tranquil rivers are the stuff of legend. Access drop-off points by boat, then walk or drive in. Deep sea fishing excursions are most promising from May through August and average six hours of fishing per day (we call it a half-day). Guests depart at 7 a.m. and return in time for a late lunch, or lay-about until the 1 p.m. launch and fish in the afternoon, returning in time for dinner at about 7 p.m. Either way, guests enjoy a half-day free to enjoy spa services and other resort amenities. And, since couples are often split on their passion for fishing, the spa option is a popular one. From May through September, find coho (silver salmon) and sea bass. At the height of summer, giant tyee (king salmon) reign supreme. Halibut are prolific from March through September, and ocean fly fishing is best from July through September; fish for coho (silvers) and rock fish in a 25-foot open-air centre-console vessel. Locals have long-favoured Megin and Pretty Girl lakes as bountiful sources of cutthroat trout. Access is by floatplane however, so transportation surcharges apply. Choose float tubes or kick boats, fly or spinning rods. Young people love to fish of the dock and can easily while away an afternoon - or two. The bridge is a favourite spot to sit and jig - within sight of the cookhouse, but far enough away to inspire freedom. From the time Chef May opened the resorts in 1997, he wanted a designated demonstration kitchen with all the trimmings. But, when he started working in the Outpost's new 3,000 square foot cookhouse, with its 70'-long wrap-around counters and huge open-kitchen, he didn't want to leave. So, instead of setting-up formal classes to pass along his modern natural techniques, he invites guests to pour a glass of wine, pull up a stool, and settle in for a spell, on the house. Real foodies end up behind the counter or in front of the grill, leaving, eventually, with pockets-full of notes and Chef's hand-written recipes. Singles, couples and groups of guests are invited to inquire in advance or on a whim, about scheduled or impromptu cooking classes with Chef. Special gourmet weekends, including cooking classes, foraging and visits to local growers and suppliers can be quoted upon and arranged by request.